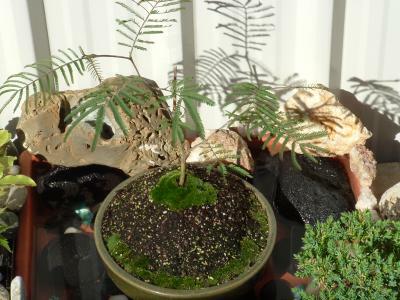 I think this is a wattle tree, I dug it out of a steep bank on the roadside a couple of months ago, took it home and potted it, then scraped some moss off the driveway and placed on it(which has now taken root and started to spread all over). Unfortunetly its a prolific weed in newzealand, it comes from austrailia I believe and usually I cringe when I see it being cared for in peoples gardens but as its your first bonsai and a lovley start at that I'm having a hard time disliking it. Yes this looks like a wattle to me, Like the moss growing on it keep up the good work.